Worried about Turkey and its plans for an 'Islamic Army'? You should be! Do you remeber during the referendum when David Cameron made it clear that there was no chance of joining the EU? 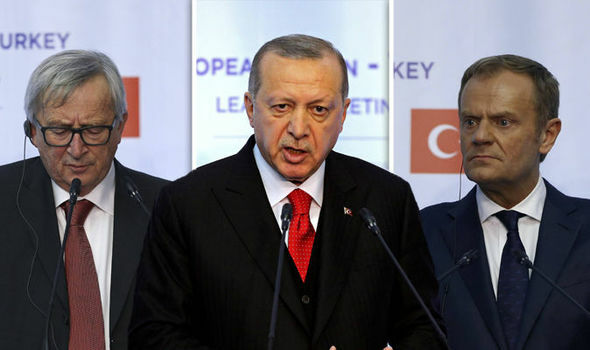 Well at a joint summit Turkeyhas demanded EU membership, with President Recep Tayyip Erdogan increasing tensions with Brussels by warning officials ignoring Ankara would be 'a big mistake'. He said Turkey's efforts to help with the migrant crisis should be praised and also called for increased visa liberalisation for 80 million Turkish citizens across Europe. Jean-Claude Juncker appeared to immediately agree stating that stopping Turkey’s accession talks with the EU would be 'simple but superficial'. In another worrisome turn of events Turkish state’s media mouthpiece Yeni Şafak has suggested uniting with the Organisation of Islamic Cooperation (OIC) to form a joint army of 57 states to simultaneously attack Israel from all sides. Mr Erdogan has not ruled out his support for the proposal and has on several occasions said he would like to resurrect the Ottoman Empire. The ruler has established military bases in Qatar and Somalia and recently reached an agreement with Sudan to acquire a Sudanese island in the Red Sea to be used as a military base. This kind of crazy talk could potentially lead to World War 3 and wise heads are needed. Do you agree we need to leave the failing EU behind? Read: "Union Jack sign branded "Offensive" in Sadiq Khan's London"